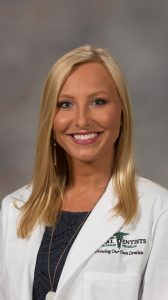 JACKSON, Miss – Kaitlin Coker, a recent graduate of Northwest Mississippi Community College and a junior at the University of Mississippi, has been selected to participate in the undergraduate portion of the Mississippi Rural Dentists Scholarship Program. She is the daughter of Tray and Stephanie Coker, of Charleston. Created in 2013 by the Mississippi Legislature, the Mississippi Rural Dentists Scholarship Program identifies up to seven college sophomores and juniors who demonstrate the necessary commitment and academic achievement to become rural pediatric or general dentists in the state. The program offers two years of undergraduate academic enrichment, including Dental Admission Test preparation and clinical experience in a rural setting. Upon completion of all dental admissions requirements, the student can be admitted to the UM School of Dentistry. During dental school, each MRDSP scholar may receive $35,000 per year, based on available funding. The program will award nine scholarships in 2018-19, totaling $315,000. With continued legislative support, administrators hope to grow the program to 12 scholarship totaling $420,000 by 2019. Additional benefits include personalized mentoring from practicing rural dentists and academic support. After completing dental school, the scholars must practice general or pediatric dentistry in a rural, medically underserved community. The program scholar must provide dental services in a full-time clinical practice in an approved Mississippi community of 10,000 or fewer population located more than 20 miles from a medically served area. The program provides a means for rural Mississippi students to receive Dental Admission Test preparation, benefit from mentoring, learn the art of oral health care from practicing rural dentists and earn a $140,000 dental school scholarship in return for four years of service. For more information, contact Dan Coleman, MRDSP associate director, at 601-815-9022 or jdcoleman@umc.edu, or go to http://www.umc.edu/mrdsp.